The Wisconsin Department of Natural Resources, charged with overseeing the wolf hunt, has no rules in place that require hound handlers to report dogs injured or killed in the pursuit of wolves during a hunt. In fact, there is no monitoring or certification program whatsoever in place for the use of dogs in the wolf hunt; thus the state has little ability to hold hound hunters accountable for training or hunting violations or to prevent deadly and inhumane wolf-dog confrontations (e.g., hunters allowing dogs to overtake and kill rifle-shot wolves). 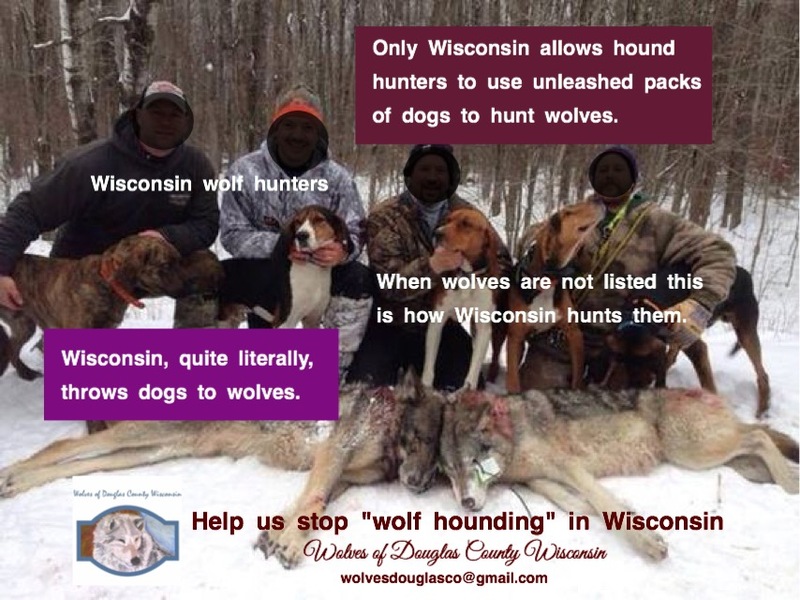 These circumstances explain why Wisconsin stands alone: using dogs to hunt wolves is no better than state-sponsored dog fighting. In 2013 & 2014 Wisconsin sanctioned the use of dogs to hunt wolves. According to DNR regulations, hound handlers are only allowed to use up to six dogs at a time to trail wolves. But handlers often replace tired dogs with fresh ones and younger dogs. It is common for a handler to be unable to retrieve the tired dogs, and end up with up well over 6 dogs chasing one wolf, potentially twice or even three times as many. There is no monitoring system in place to ensure that only 6 dogs pursue wolves. I wrote the following in 2013 just prior to the first wolf hunt in Wisconsin to use dogs; I’ve seen first hand the effects of this bloody sport of running hound on bear as a seasoned WDNR winter wolf/carnivore volunteer tracker. I’ve seen the torn up bodies of bear hound dogs after an encounter with wolves. The wolves were defending their pups against a pack of hound dogs. This year wolf hounders can use six dogs at a time to chase wolves. What will happen if the hound’s handler is not right there when the wolf turns to defend himself? I think this will turn into a bloody dog versus wolf fight resulting in dead dogs and wolves. I am betting that this is a sport that Wisconsinites will not condone. *Wolf hunters are not reimbursed when wolves kill dog/dogs while in pursuit of wolves, but are when in pursuit of bear. TAKE ACTION: contact your Wisconsin Legislator click here and make it clear you do not sanction Wolf Hounding in Wisconsin! FIRST…using dogs to hunt wolves is barbaric and inhumane. Secondly…why are claims being paid to hounders whose dogs are supposedly killed by wolves? Yes wolf hounding is barbaric. When using dogs to hunt wolf they cannot be reimbursed if a wolf kills a dog. But during bear hunting and training wolves kill dogs in pursuit of bear and then they are compensated by the state.